“Anyone been doing some shopping lately?”, asked Tato as he whipped out his phone and opened up his BestBuy application. “I’m just gonna buy a couple things real quick”, he proclaimed. When asked why, he had but one simple answer. “Because I can!” That’s right you guys – We can! Just on Halloween we introduced Liquid Frozen Yogurt V1.95 to the world. Well here we go again. This Midnight Frost theme by the talented davidjr621 is for those people who enjoy a good dark theme. (Me included). 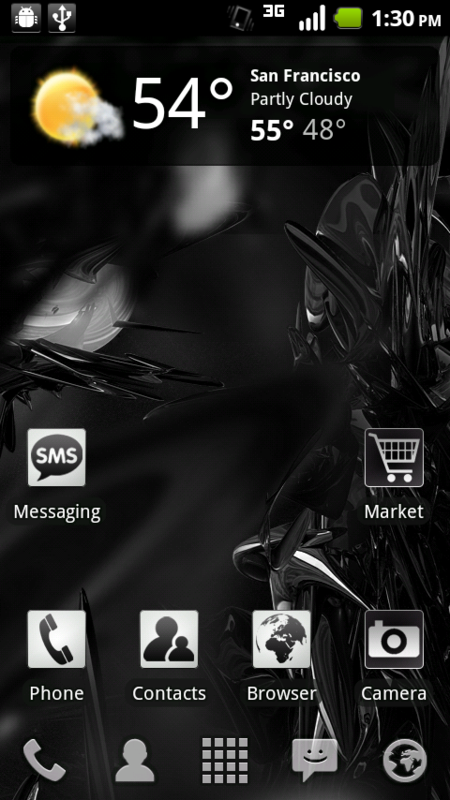 This theme is only intended for Original DROID1. Flashing on any other device will result in the bricking of your Android Device. Droid-Life and the Theme Developer shall not be held responsible for your own silly actions. Thank you, and enjoy! 3. Make a nandroid backup. 7. Boot up and enjoy the stylish wonder! If you like this theme and want to check out more from the developer, check out his site that I have linked down low. Thanks every, and have a wonderful weekend! Leave questions, comments, concerns, or rants in the comment section below! I wanna thanks davidjr621 for making all these great themes. Check out his forum spot here. And don’t forget to donate. Huge thanks to Liquid for all his ROM work! Check him out here!